After an awesome stay in Queensland, the next destination on my Australian itinerary was a 2-day trip to visit Sydney. I have always wanted to see the iconic Opera House in person, and was so lucky to be able to score some really affordable flights for under $120 CAD! On the first day, I walked ~43k steps in total (according to an app on my iPhone), which was so tiring… but completely worth it! I went across the Harbour Bridge to check out Luna Park, explored “The Rocks” district where I learned about Sydney’s convict origins, and went for a nice dinner at the Quay. Later that night I thought I might try walking back to my hostel.. but that definitely turned out to be a very bad idea. First of all, I really underestimated the distance, and I also had a scary encounter with a large man who started following me as I was walking down a dimly-lit street.. D: Immediately after I noticed this, I quickly ran to to a slightly busier street and jumped in the first taxi I saw. Luckily I arrived back at my hostel safely, and then was able to get some much needed rest. The next morning I went to Darling Harbour. I found this district to be very touristy and expensive, but I really enjoyed the nice weather and views. 🙂 While there, I decided to have a late breakfast on the upstairs patio at the Hard Rock Cafe (which had an amazing view of the Harbour)! 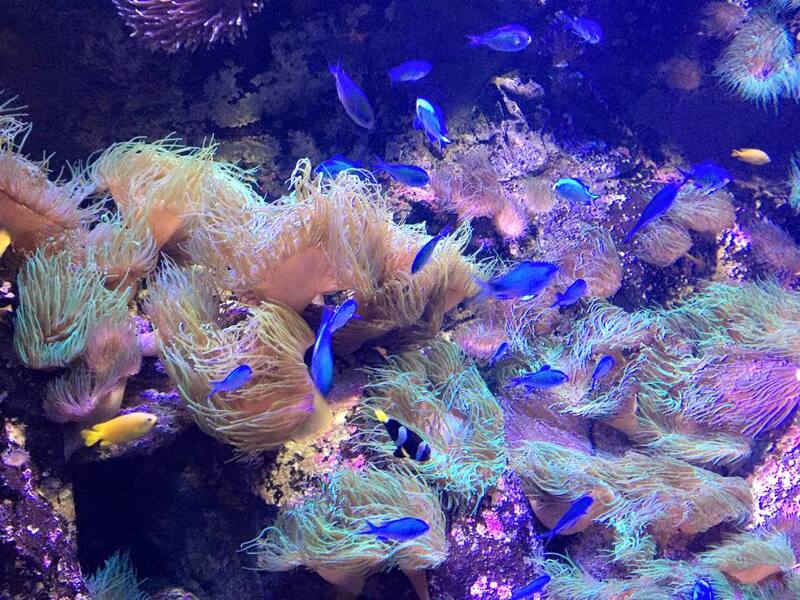 After that, I went to visit the popular SeaLife Aquarium, and saw all kinds of fish & sea creatures. It was expensive, but considering how much time I spent there, it seemed worth it. 🙂 I ended my day in Sydney by going for a nice stroll through the Royal Botanic Gardens before flying back to Singapore, and then Jakarta. Love your Sydney photos. It’s such a great city to walk around. I did that myself recently. Though nowhere near 43km that you did! Beautiful night photos of the harbour! I feel you on the walking everywhere – that definitely happens to me when I travel to cities. Walking is definitely the best way to see places and I get so distracted seeing the sights that I don’t realize how much walking I’ve done until I’m exhausted! What a whirlwind 48 hours you had! Sounds like you really made the most of it and you took some great photos too. Do you think you’d go back to Sydney if you had the chance? 43k steps is quite a bit of walking! It looks like you made the most of your 48 hours in Sydney. Wow, 43K steps, that’s incredible! What a workout. Sydney is so beautiful, the photos of the opera house are so nice! I am in Sydney right now! These are some great tips and you saw a lot of the city in just a short time. I managed to do all these in 2 days as well and my step count was crazy also. Getting fit. What did you think of Queensland vs NSW? I LOVED Tropical north Queensland, but Sydney is a really cool city! Thanks for this post … you have helped me plan up upcoming trip better. Which would be a good area to stay?